Since 2005, market leader Petron Corporation has tested its cutting-edge fuels in real world driving conditions to validate its laboratory findings. This has resulted in fuel innovations that best match the requirements of Filipino motorists, for all types of vehicles, on all types of terrain. Following the certifications issued by leading global laboratories which rated Petron’s Blaze 100 Euro 6 as surpassing the most stringent fuel technology and emission benchmark in the world, the Philippines’ most advanced gasoline was field tested in a marathon performance run across the length of Luzon. With Honda as the official vehicle partner, test teams were deployed in two driving modes: hypermiling mode to test fuel efficiency and normal mode to test the overall driving experience. The six-day run saw the test teams driving up to Ilocos Norte and then all the way down to Sorsogon, before turning back to return to Metro Manila. 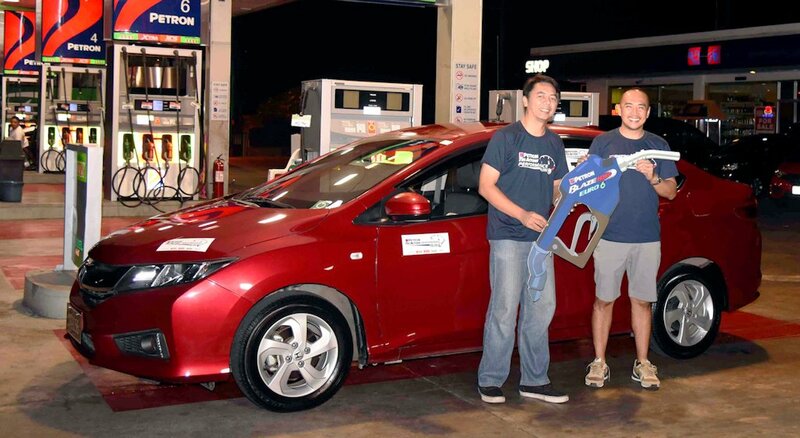 For the hypermilers, the challenge was to see how far they could go on one full tank of Petron Blaze 100 Euro 6. In normal mode, the cars were heavily loaded with luggage and other equipment, and drivers were asked to drive as they saw fit depending on the terrain and traffic conditions. Meanwhile, Antonio Siddayao and Lester Constantino, on-board a Honda CR-V 2.0 AT were testing the new Blaze formulation in normal driving mode. Over the course of the six-day run, Siddayao reports: “At our first fill-up, we did not notice any significant change. After our second refill, the engine response was noticeable and we took note of our fuel consumption from thereon. From Laoag, Ilocos Norte, to San Fernando, La Union, we only consumed 12-liters, despite some sudden accelerations and averaging highway speeds of 60-90 km/h.” Driving through the varying terrains and traffic conditions in the southern corridor of Luzon until the finish in Naga, driver logs showed that the team used about 185-liters on 2,367-kilometers (12.79 km/L). That’s like traveling from Manila to Baguio 9 times on just three fill-ups of the Honda CRV’s 58-liter fuel tank. “Not bad for a 2.0-liter SUV,” Siddayao concludes. According to Petron R&D, due to its pure formulation and very high octane, Petron Blaze 100 Euro 6 gives motorists six advantages and benefits, namely: (1) improved fuel efficiency; (2) powerful engine performance and acceleration; (3) guaranteed cleaner engines on just one full tank; (4) improved combustion with its unique fuel and additive formulations; (5) significantly reduced harmful emissions; and (6) reduced maintenance costs (e.g., longer catalyst life for emission system). Based on the fuel efficiency results and driver feedback, these are tangible benefits that ordinary motorists can experience with Petron Blaze 100 Euro 6. These also confirm the results obtained in tests conducted by leading global laboratories in Singapore, the United Kingdom, and Germany. Samples of Blaze 100 Euro 6 were taken from Petron’s Bataan refinery and randomly from its stations by SGS, the world’s leading inspection, verification, testing, and certification company. The samples were then sent to SGS laboratories in the United Kingdom, Singapore and the Philippines. All samples tested met specifications (EN 228:2012) for Euro 6-technology vehicles. Petron also sent samples of this innovative product to ISP The Testing Institute, a leading engine and vehicle testing laboratory for fuels and lubricants development. ISP conducted a Gasoline Direct Injection (GDI) test with Blaze 100 Euro 6 and found it did not cause carbon deposits in GDI engines. GDI is a more advanced engine technology that addresses fuel economy and emissions. It is being used in newer European, American, and Asian car models. Millbrook Proving Ground, which provides validation and engineering services in the automotive, transport, and defense industries, also tested Blaze 100 Euro 6. It conducted an Intake Valve Deposit (IVD) test and found Blaze 100 Euro 6 cleaned over 70% of engine deposits in 60 hours. Millbrook UK said Blaze 100 Euro 6 passed the “Euro 6b” emission standard— the strictest emission standard in the world. IVD tests apply to Port Fuel Injection engines which are widely used the Philippines. “We are proud that Blaze 100 Euro 6 meets the world’s best environmental and fuel technology standards. With the highest octane rating but the lowest sulfur content, it is the best gasoline in the market by far in terms of power, efficiency, engine protection, and reduced emissions,” Petron President & CEO Ramon S. Ang said. “Since our fuels are locally-produced and formulated in our refinery, we can guarantee the quality and consistency of Petron fuels. We will continue to innovate and lead in fuels technology so we can put more savings in our customers’ pockets while improving air quality across the nation,” he concluded. Is this already available nationwide? I've been using Blaze 100, seems it is still on Euro5 based on their decals. Blaze Euro 6 is now available at selected Petron stations. The roll out will be gradual. In fact, some stations are already carrying Blaze Euro 6 even if the pumps still sport Blaze Euro 5 stickers. Can we use blaze euro six to honda city vx 2017 euro 4?